A home filled with sunlight and natural, earthy and neutral details. This is what you can expect from today’s modern Spanish villa that has become the owner’s dream residence, and we can most certainly see why! Belonging to an interior designer, this coastal home is filled with some of the owner’s many collectables and travel mementoes and has become a stylish representation of his personality and lifestyle. We love the choice of white on the inside and out – forming the backdrop for the interior details that set this abode apart in true style! The outdoor areas are equally stunning, the ones with shade are perfect for al fresco meals. And those immaculate views are to die for! The bedrooms take on a more traditional coastal atmosphere in shades of white and blue that are ideal for slow Meditteranean living. 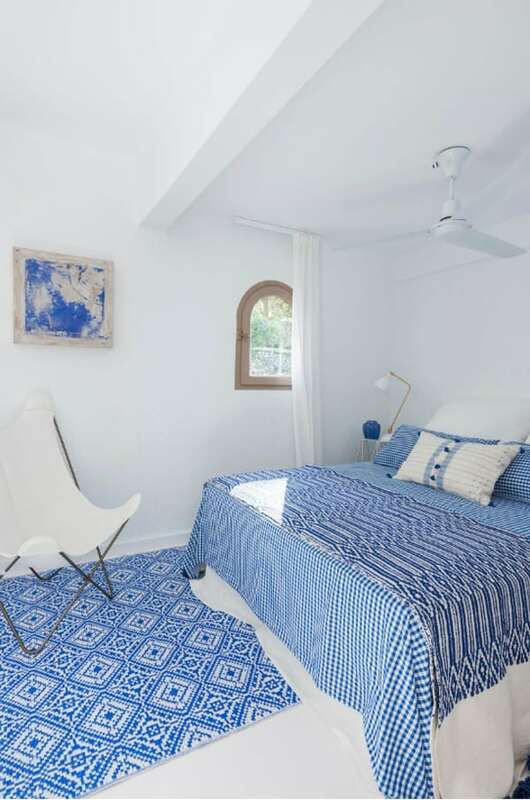 The bedrooms still feel spacious and contemporary – a stylish coastal retreat and the colourways extend to the bathrooms, creating a special space for modern living here in the beautiful coastal town of Javea, Spain. With gorgeous sun-filled Spanish days, mountain and sea views, who wouldn’t want to maximise the outdoor space around this stylish home! Poolside living is taken to a whole new level here. Beautiful patios and outdoor entertainment areas are wonderful additions to this home. We love the many options available outdoors – from sun loungers at the pool to outdoor sofas, wicker chairs, dining tables and more for the perfect outdoor experiences!